For years, Tran Thi Nga was subjected to harassment and brutalization by the Vietnamese authorities, the details of which emerged in a fresh Human Rights Watch report published earlier this year. She was finally arrested in January for using the using “the Internet to post a number of video clips and articles to propagandize against the Socialist Republic of Vietnam,” as the state media reported it. What she had actually done, in fact, was to participate in a number of environmental protests and show solidarity with fellow activists by meeting with them at their homes and attending their trials. She is not alone. In the space of a few weeks, Vietnamese authorities also rounded up Nguyen Van Oai, a former political prisoner, and Nguyen Van Hoa, a human rights activist who campaigned against the Formosa Steel environmental disaster (more on that later). Months earlier, they had arrested Nguyen Danh Dung; the bloggers Ho Hai and Nguyen Ngoc Nhu Quynh; and a number of indigenous Degar protesters. According to Human Rights Watch, there are at least 112 bloggers and activists currently serving prison sentences for nothing more than speaking their mind. What strikes the mind is that many rights activists in Vietnam have focused their campaigning on environmental issues in recent years. Why? First, because it has become a pertinent problem in the country. In April 2016, exceptionally large protests took place across Vietnam after toxic discharge from the Formosa steel plant resulted in an estimated 70 tons of dead fish washing ashore along more than 200 kilometers of Vietnam’s central coastline. The February 18-24, 2017 issue of The Economist’s Asia column, Banyan, was written from Dong Hoi, a provincial capital on the central coastline, where thousands of dead fish washed up on the shores throughout 2016. Today, the inhabitants are scared to eat the fish living off the coast, tourist numbers are down, investment has almost ceased, and fisherman struggle to make enough just to get by. Elsewhere, the environmental situation is not looking any better. 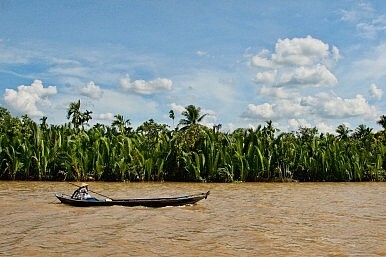 The Economist reported that pollution mars much of the country’s landscape — dam-building is corroding the Mekong Delta; smug smothers Hanoi while much of Ho Chi Minh City may well be underwater by the end of the century. The full list of problems goes on and on. Interestingly, another reason for the surge in environmental protesting is because the environment is one of the few issues that cuts across all divides. It unites poor rural fisherman and relatively wealthy urban liberals; consumers and producers; democrats and socialists. This is also the reason why it has become an important issue for the Vietnamese government. I suspect it knows that, unlike trade unionism or free speech, environmental concerns embolden critics and disaffect loyalists. The impoverished sympathizer might stomach a muffled media and the party ventriloquizing for the masses. But when farmlands flood because of industrial waste and poor upkeep, or waters contain only inedible fish, or a foreign-owned factory treats the country’s environment with contempt, the ideals of the communist revolution must be cast in doubt. The Vietnamese government, however, will fail. The environment, arguably to a greater extent than other concerns, shows the fundamental problems that exist in Vietnam’s atavistic Communist regime. Indeed, for all the apparent complexities of the politics of Vietnam, it is actually rather simple: without elections and any meaningful public engagement, the government’s legitimacy depends on economic growth. But environmental concerns are severely testing this legitimacy. One example: The government has long claimed that activists are mere stooges of foreign powers. Now, it is the one defending foreign investors accused of environmental destruction. More importantly, to sustain economic growth, the Vietnamese government needs foreign investment, mainly from China, which is the very thing that will destroy the environment, as the people of Dong Hoi know all too well. A spokesman for Formosa, a Taiwan-based company, was rather prescient when he said the Vietnamese should decide if they want to catch fish or “build a modern steel industry”. A subsequent hashtag, #IchooseFish. became popular on social media. Even though Vietnam’s central government has decided that environmental destruction needs to be curbed, it is up against the monster it created. A pillar of Doi Moi, started in 1986, was decentralization, the shifting of power from the center to the provinces. However, by 2004, when the government issued Resolution 08, it was clear things hadn’t gone to plan. “The conception and awareness of decentralization policies and solutions are unclear, incoherent, and inconsistent between the central and provincial governments,” the resolution reads. Decentralization necessarily requires a fundamental shift in the role of the state, from social planner and decision-maker to facilitator and rule-setter. However, in such a hierarchical and unitary system like Vietnam, this shift is never simple as it not only involves changes in the government’s internal organization, but also undermines its inherently discretionary power. This is how we end up in a situation where the central government can introduce laws to curb environmental damage and few politicians at the provincial level pay heed. Indeed, many have grown fat from ignoring regulations. The only solutions are to strengthen the will of the central command, endangering the decentralization program that is four decades in the making, or attempt to reform the actions of the provincial administrators, which doesn’t appear to be fruitful. With neither working, the Vietnamese government has reverted back to what it knows best: muzzle dissent and continue as normal. Vietnam's population is increasingly vocal about economic, political, and social issues, to the government's dismay.